In the recent past our Customer Care cell has been receiving information about passwords being shared with friends/relatives/employees leading to misuse and misappropriation.As an organization ItzCash gives top priority to the interests and well being of its channel partners including the safety and security of their business and funds. Change your SAM, EAS, ICW Master Account and Pay on Web passwords frequently. Do not exercise the save password option. Do not use simple passwords; use special characters wherever system permits. Do not share your passwords with anybody including close friends and relatives. If you have shared the passwords with your employee, please change the password immediately as soon as such employee leave services. Immediately report misuse of SAM, EAS, ICW Master Account and Pay On Web to Company to take possible corrective action to reduce further financial loss to and investigate the matter further. Please note that the company will not be responsible for any kind of loss incurred by the channel partner on account of non-observance of system security standards if any on your part. Dear partner, Please do not entertain any third-party solicitations for rail IDs. 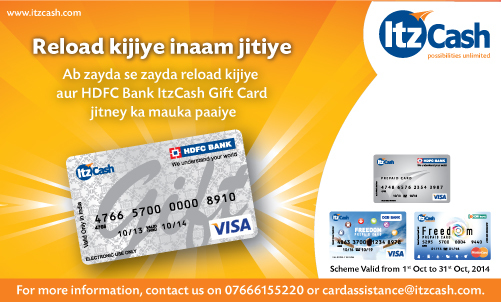 Kindly get in touch with authorized ItzCash employees or ItzCash customer Care only. Also please do not deposit any money in any individuals bank account. As per RBI mandate from 1st Dec 2013, for shopping with DCB Freedom Prepaid Card & HDFC Bank ItzCash Aadhaar Saral Money Card at retail outlets, use your existing ATM PIN. For details call 07666155220. 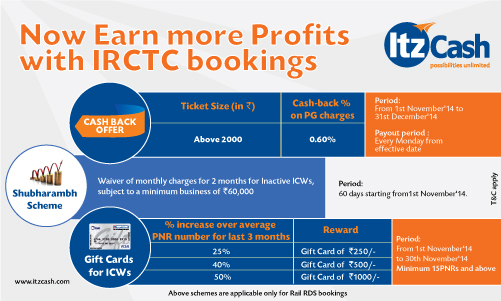 Dear Channel partners please note that today is the last day to make the DSC & KYC charges payment for IRCTC login.As per IRCTC guidelines all login IDs whose payment has not been recd by IRCTC by 31st July, 2014 will be deactivated on 1st August, 2014. Launching ItzCash IMPS Money Transfer Wallet on 01st August.14. 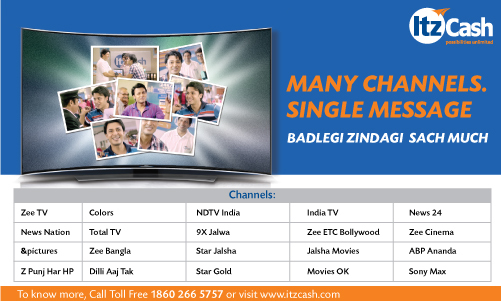 Transfer money instantly and earn maximum benefits. For more information call 18602665757.